Orchis quadripuntata owes its name to the four little spots at the base of the labellum. 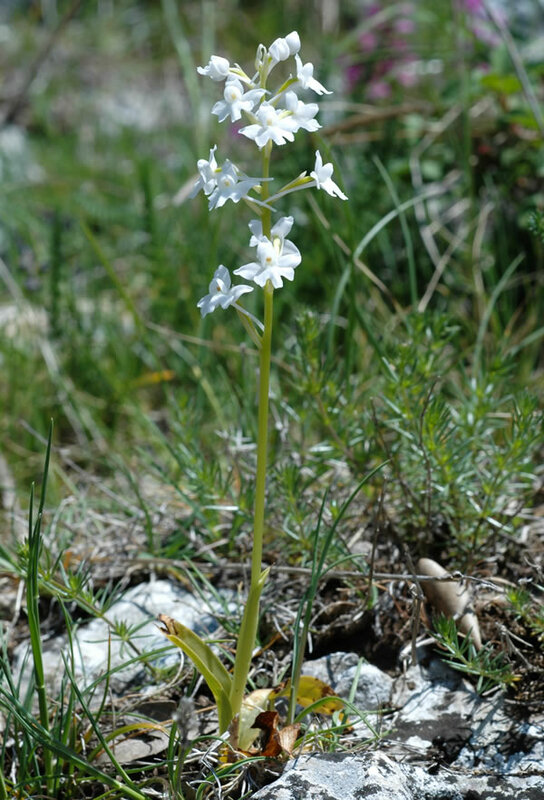 With a height of only 10 to 30 cm Orchis quadripunctata is a small and slender plant. The stem is growing out of a rosette of 2 to 6 foliage leaves, which can be spotted or unspotted. 1 or 2 leaves sheath the lower part of the stem. The cylindrical inflorescence has 5 to 30 flowers, loosely arranged. The spur is almost as long as the ovary, very thin and horizontally spreaded or bent downwards. The ovary is sheathed by a small bract. Only the two petals form a little hood. The rounded sepals are spreaded horizontally and upwards. The labellum is three-lobed. The two pollinia have their own sticky plates, the flowers are pollinated by insects. Orchis quadripunctata was first described by the Italian scientist Domenico Maria Leone Cirillo (1739-1799), cited by Michele Tenore in his Flora Napolitana (1812). H. Kretzschmar et al. view Orchis quadripunctata as belonging to the section Pusillae of the sub-genus Masculae. 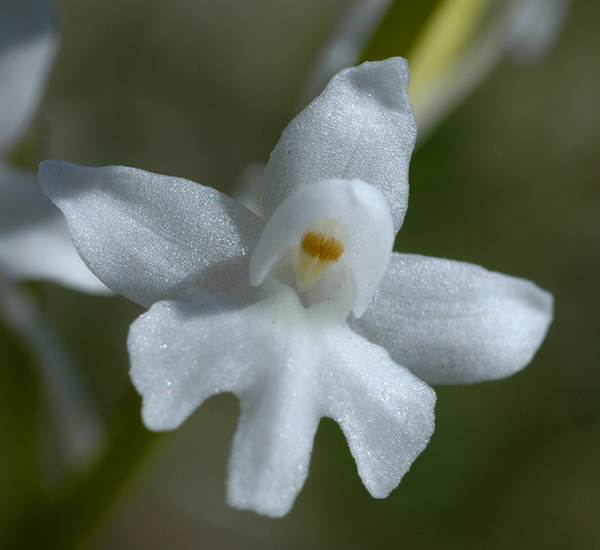 There is still some discussion about the denomination of the plants found in Cyprus, which are probably Orchis anatolica influenced by Orchis quadripunctata. The flowers of Orchis quadripunctata can be rose, pink or purple-red. 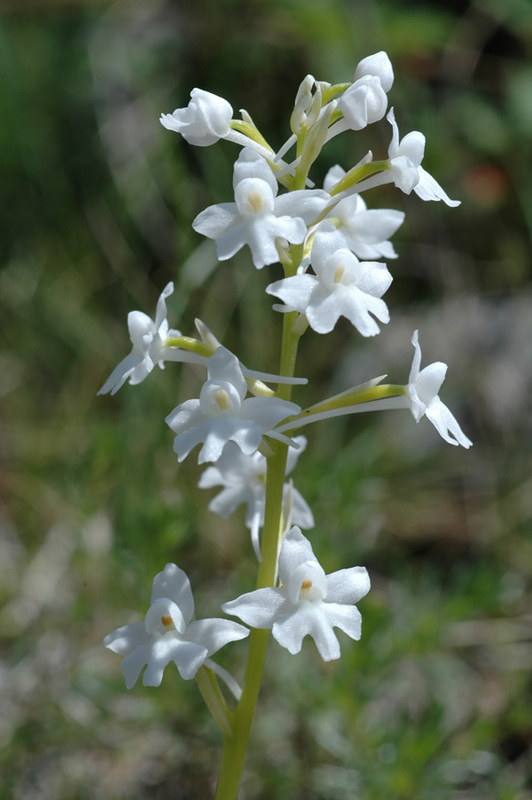 The white-flowered plants have been described as Orchis quadripunctata f. albiflora, 1980 by J.-E. de Langhe and R. d’Hose in the Bulletin de la Societe Royale de Botanique de Belgique, and as Orchis quadripunctata var. albiflora, 1989 by Chryssoula and Antoine Alibertis in L’Orchidophile. Alibertis (“4 maculas ad basim labelli gerens”) as well as H. Kretzschmar et al. mention that this form preserves the colour in the 4 points of the lip, but the flower shown here is pure white, without the coloured points. 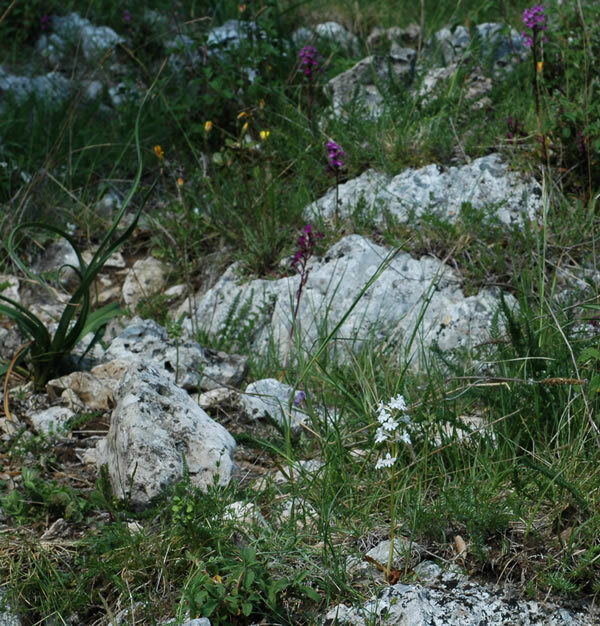 Habitats of the Orchis quadripunctata “albiflora” are mentioned for Italy and Greece. Orchis quadripunctata is growing on meadows and pastures, as well as in macchia habitats or in bright forests, up to 1600 m. Bloom is from March to June. The species can be found in Southern Italy (with the exception of Sicily), in the coastal regions of the Balkan and in Greecee including the island of Crete.